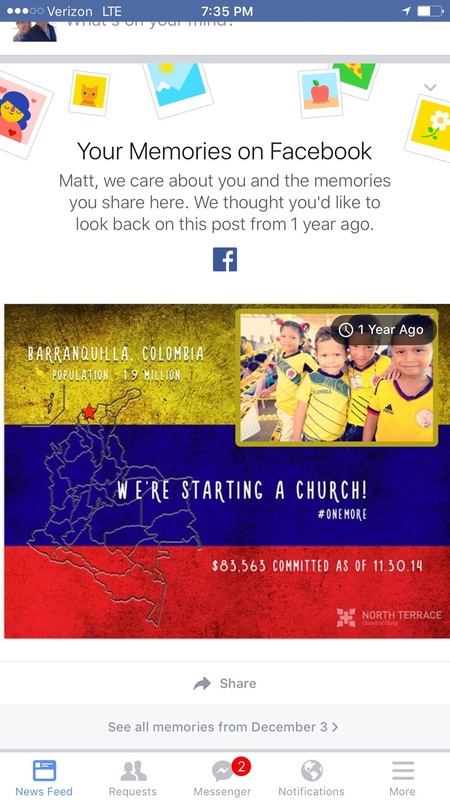 I was reminded of that this morning when Facebook revealed to me that exactly one year ago is when North Terrace gave the $80,000 needed to start a new church in Barranquilla, Colombia through Stadia Church Planting and Compassion International (actually the people of NT crushed the goal and gave $110,000)! That still gives me goose bumps just typing that. Throughout the year we have received updates from Colombia about the building process of Casa Mayor Church and the Child Development Center that Compassion has started in partnership with the church. There are 197 children in the CDC and on last Mothers Day the families at North Terrace stepped up and sponsored 180 of them! 1) The community has already been impacted through the worship services that have already begun. 2) Pastor Walter Gailindo now has a radio program that reaches many with the good news of Jesus. 3) They have started classes parenting classes and a youth group. 4) And all 197 children in the CDC are healthy, growing in Christ and even were given their very own Bibles! Just allow all this to soak in for a moment just in case you need more proof that God can do exponentially more with the little you have when you put it in His hands. I love how God is teaching our people in Zanesville, OH how we can be world changers through His power. Here's to what God is going to do in our lives over the next 365 days! The Child Development Center in action!